In April this year we headed down to Melbourne for a blitz on the Yarra River. This time, with the support of Port of Melbourne, we headed down to do more cleaning closer to the mouth of the river that leads into Port Phillip Bay. 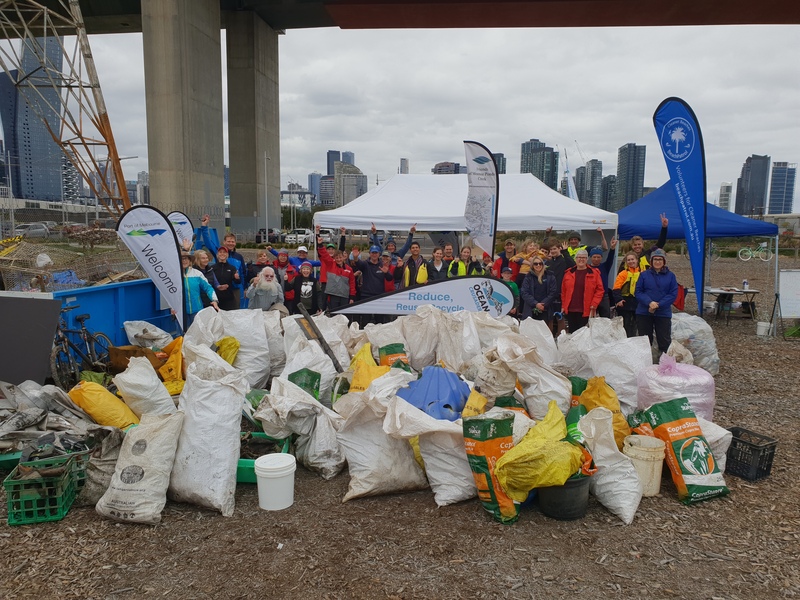 We were to complete 2 days cleaning in the port to get an idea of what was in their region and then we would run our community Paddle Against Plastic in the Moonee Ponds Creek, one of many tributaries to the Yarra. We did a scout of the creek on the Monday leading up to the event and it is rare that Aaron (Cleanwater Group) and myself actually get shocked, but this place was astounding. At the mouth where we parked it was pretty ordinary but as we moved under the Bolte Bridge and into what is locally known as ‘The Pond’, the amount of debris was next level. Lucky we conduct ‘Next Level’ events. During the week we headed out with our vessel Salter with Cleanwater Group and Beach Patrol Australia to clean up several different areas of the Port. Kristy from the Port also joined us to see the issue first hand. We started with the rock wall at the entrance to the Yarra and with Kristy filling bag after bag of plastic bottles, the rest of us tackled the other debris, which was so numerous we were struggling to remove it all. Unfortunately we didn’t have the vacuum on board for this trip as it was to be about removing the bulk of the debris, not the small stuff, but it didn’t take long to regret that decision. Doing half a job just isn’t the Ocean Crusaders way but with so much debris, well we had our hands full anyway. In the morning session we probably covered maybe 200m. In the afternoon session we covered about the same so in a day we only covered 400m, and as I said earlier, we still need to run over it with the vacuum. The picture on the right is the days haul. Day two and we decided to get a sample for data from Moonee Ponds Creek. We headed up the creek and the state of the creek was just appalling. About half way up there was a litter trap which blocked the entire creek so it should be collecting all the debris. It was empty. We collected our sample and had a boat load of debris back at our base by 0930. We then headed to the end of the container wharf. The rocks along the back there were covered in tangled ropes and pallet wrapping amongst all the other stuff we find in the main river, bottles and polystyrene etc. That afternoon we cleaned in front of the Ports tower. By sampling each area we could get an idea as to where the debris is coming from so we can work closely with the Port of Melbourne to eliminate it in the future. Come Sunday and Melbourne did it’s usual weather trick but it didn’t drive the enthusiastic volunteers away. 122 people turned up with half on the water and half on the land. It was a perfect combination and soon the bags were flooding back. The system of having land people put the bags on the river bank for kayaks to ferry out to the dragon boats worked a treat. Then our boat did a couple of runs to empty out the dragon boats. We also had the outrigger crew head further up the river. It was an amazing team effort by all and at the end of the day we had a staggering amount of rubbish piled up. It was by far our biggest clean up for a paddling event, not in numbers but with the amount of rubbish brought back in such a short time. 938kg returned to the shores but that doesn’t do the work justice as most of the debris was polystyrene and plastic bottles. In fact 1815 bottles were brought back. Beach Patrol Australia, Love our Streets and Boomerang Alliance are all working together to get the local government to commit to a container deposit scheme. They were a great help all week and the pile of over 3,300 bottles from the entire week shows there needs to be a scheme in Victoria. Luckily we had Nick Wakeling, the shadow environment down on the morning as he saw the issue and spoke with the groups. Hopefully this will help the Liberal Government support the CDS. Also on deck were two amazing volunteers for Friends of Moonee Ponds Creek. They were real go getters and go stuck into cleaning and dragging bags up from the boat. Going to be awesome to work more with them in the future. These stats take in the debris removed on the day of the Paddle Against Plastic and our sample, hence 1.15 tonne of debris was removed. There was still plenty more work to do but the stats draw a few alarming numbers and apart from bottles, polystyrene again topped the charts. In fact every time we clean in Melbourne, Polystyrene and Plastic bottles are the two major items we remove. Something needs to be done to stop this getting into the waterways so we challenge the councils, government and Melbourne Water to take action as we simply can’t continue to let this debris out into the oceans. Stopping it at street level is what we need to do. It’s easier to clean out a collection device at street level than it is to clean the rivers and creeks. It takes less time and hence less funding. The liberal government, through Nick Wakeling, has made an election promise to put a full time cleaning team on the river if they get into office. This shouldn’t be an election promise from one government. It shouldn’t matter who gets in. This river and it’s tributaries need work and we know we can make it clean. We just need the right funding and we can put a full time crew on the river and we can make a huge dent in the amount of debris escaping to Port Phillip Bay. Ocean Crusaders are not about lobbying the governments, we do the cleaning and provide data to organisation that do the lobbying. The data was uploaded into Tangaroa Blue’s Australian Marine Debris Initiative Database, Love our Streets, Beach Patrol Australia and Boomerang Alliance were all involved and will continue their push and we also had Friend of Moonee Ponds Creek and the Baykeeper (Looks after the bay) involved on the day. These people will use our events to lobby for more funding. Until that funding comes, we have to continue to chase private enterprises to fund our clean ups. 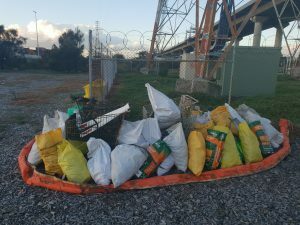 This is not the way it should be and we will forever be grateful that an organisation like Port of Melbourne have stepped up to play their part. In fact since the new owners took over the Port, this is the first thing they have sponsored and let’s hope it is not the last. But whilst I thank the groups for their support, I have to say a few very special thanks. Through the week Aaron from Cleanwater Group volunteered his time to help out cleaning. They are a passionate company and we love working with them and hope we can drive business there way so they can install the collection devices that mean our waterways are clean. Erol Noyan, a good friend from our Whitsundays days was on board all week and was so enthusiastic in his efforts. Ramona and Ross from Beach Patrol Australia helped out with cleaning and sorting and made the task so much more enjoyable. Marie also came out on the boat one day and was amazing at the PAP in being that extra pair of hands that we needed. And so many people had a chance to get on the water because of our amazing supporters Aquayak Kayaks. They continue to provide craft for us for our events and again donated more craft to our fleet so we can run our events in the future, getting more people into kayakying. They don’t get a lot of reward out of what they do financially, but they are passionate about what we do and we are grateful for their support. If you are looking for a Kayak, please look at Aquayak. They are quality, Australian made kayaks and are made to last. And don’t forget the Dragon Boat and Outrigger crews. You guys are fantastic to work with and have so much enthusiasm. You are a key link at our events. But most of all, to the 122 volunteers who came and got muddy, wet and dirty on a chilly Melbourne day, we thank you all. The passion, smiles and dedication to our environment from all of you inspires us to continue to run these events. You make our job easy and you make Ocean Crusaders look amazing, yet it is our volunteers who do the job for us. We will be back in Melbourne at least 6 times over the coming 18 months and plan to run events when we are down there so stay tuned for our next event location. Ideally we want to be there full time so fingers crossed we can make that happen.